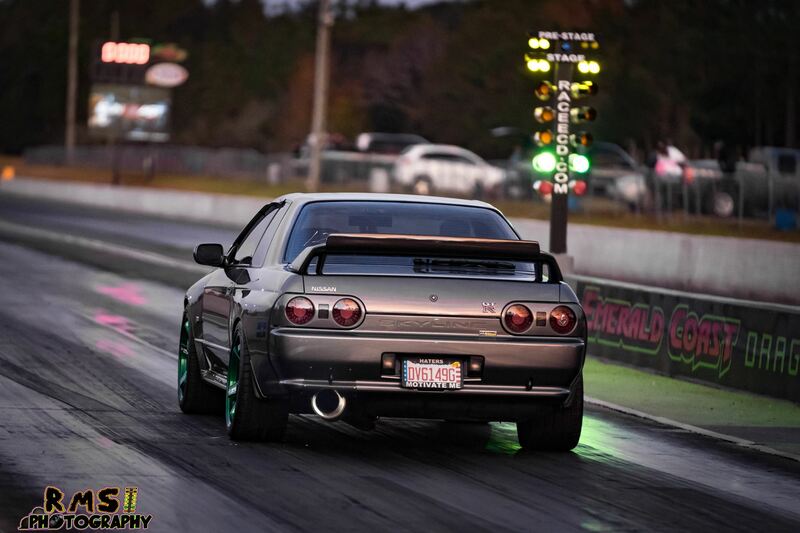 This upcoming weekend will be a busy one at the Emerald Coast Dragway! Friday Frenzy, Summit ET Series on Saturday and ECD Moto Days on Sunday, all wrapped up with a $10 Tuesday leading into early next week! Friday August 10th will be our Friday Frenzy, a well prepped all run all welcome test & tune on Friday night also including the 850 top ten list monthly races! Gates open 5PM, track hot 6PM, sunset 735PM, 850 top ten drivers meeting at 8PM and we race under the lights until 11PM. $15 at the gate for crew/spectators, drivers are $25, kids 12 & under free. 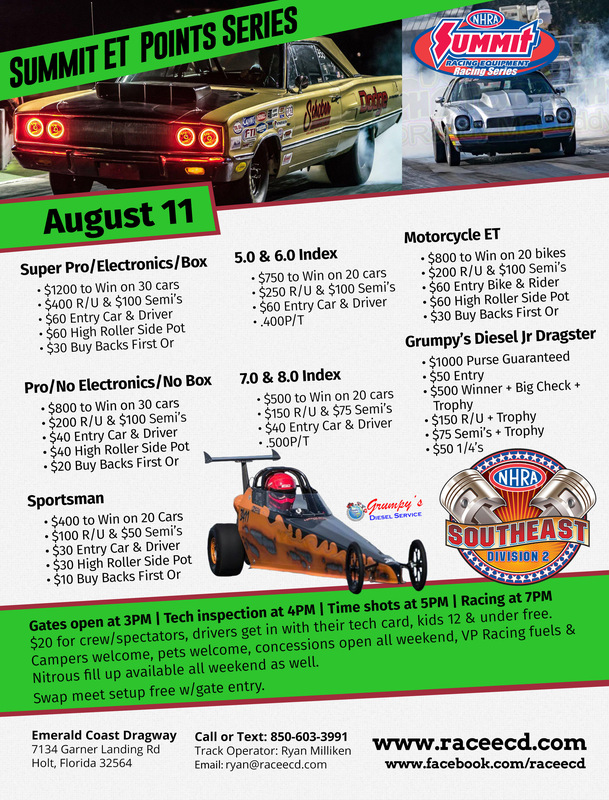 Saturday August 11th is our NHRA Summit ET Series points race! 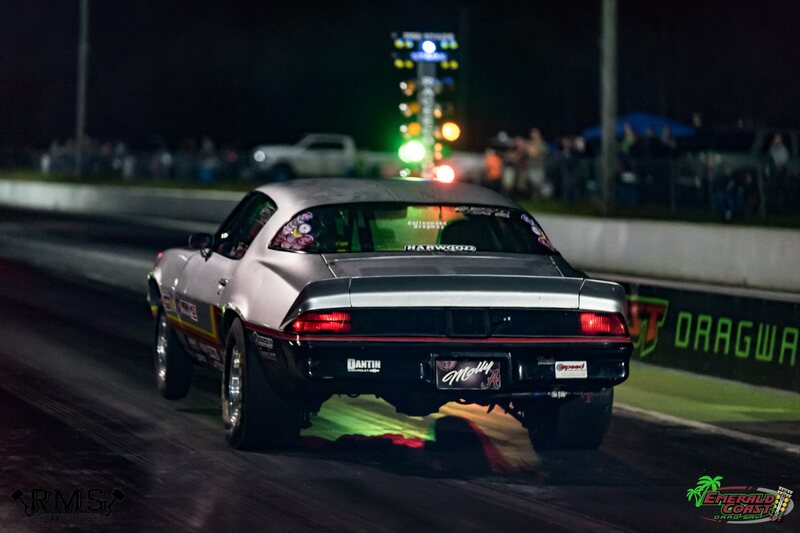 Super Pro ET, Pro ET, Sportsman ET, Motorcycle ET, Grumpys Diesel Jr Dragster ET as well as 5.0/6.0/7.0/8.0 Index classes battling it out for cash purse and series points. Gates at 3PM, tech inspection 4PM, time shots at 5PM, eliminations to begin 7PM (735pm sunset) and we race until last racer standing in each category. $20 at the gate for crew/spectators, drivers get in w/their tech card, kids 12 & under free. We have VP racing fuels on hand for everyone and plenty of it! Nitrous fill available at the track as well. Sunday August 12th is our ECD Moto Days. 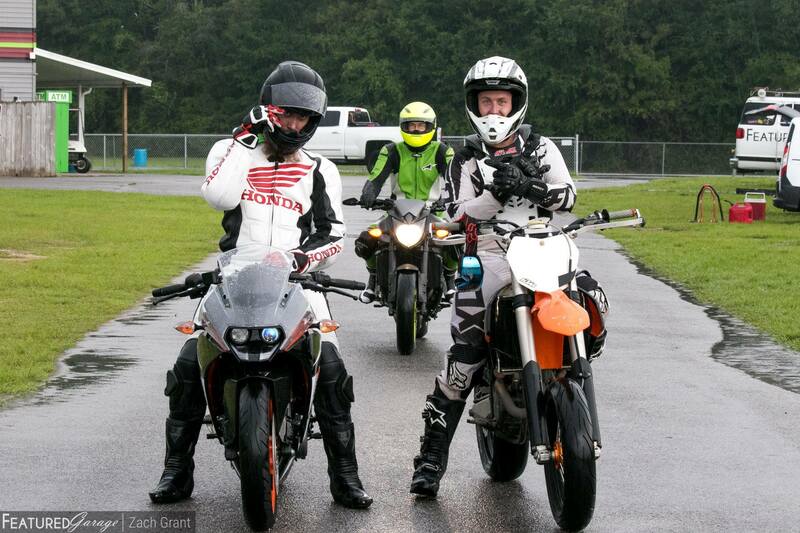 Bring your motorcycle, bring your go-kart, bring whatever you want to rip around through the pit roads with. Be there at 9AM, drivers meeting at 945AM, course goes hot at 10AM, ride til 2PM. Afternoon thunderstorms forecasted so plan accordingly w/travel plans for those of you heading our way on 2 wheels without a trailer. $40 to ride, $10 to watch, kids 12 & under $20 to ride or free to watch. Ten Dollar Tuesday returns Tuesday August 14th! $10 gets you in the gate, if you want to go down the track stop by the tech shack to fill out a free tech card and make as many laps as you want! Aimed at our street car crowd but race cars are welcome too. Street cars won’t get the cone that pushes them out of the groove on Ten Dollar Tuesdays, track will be kept clean and safe but glue will be kept to a minimum. Bring your hot rod out, pop the hood, show it off, turn that stereo up, make as many laps as you want… tonight is your night! Looking at potentially running another Tuesday on the 28th, attendance on the 14th will dictate that… so come on out and show your support!